For the mathematician, see Harold Rosenberg (mathematician). For the experimental physicist, see Harold Max Rosenberg. Harold Rosenberg (1906–1978) was an American writer, educator, philosopher and art critic. He coined the term Action Painting in 1952 for what was later to be known as abstract expressionism. Rosenberg is best known for his art criticism. From 1967 until his death, he was the art critic of The New Yorker. Harold Rosenberg was born on February 2, 1906, in Brooklyn, New York. After studying at the City College of New York from 1923 to 1924, he received his LL.B. from Brooklyn Law School (then a unit of St. Lawrence University) in 1927. Later, he often said he was "educated on the steps of the New York Public Library." Rosenberg embraced a bohemian lifestyle upon contracting osteomyelitis shortly after attaining his degree; the condition ultimately necessitated his use of a cane for the rest of his life. Throughout the 1930s, Roseenberg embraced Marxism and contributed to such publications as Partisan Review, The New Masses, Poetry and Art Front, which he briefly edited. From 1938 to 1942 he was art editor for the American Guide Series produced by the Works Progress Administration. During this period, he "slowly ... converted to an anti-communist and democratic stance on art toward focusing on individual creativity and the independence of the artist." For much of World War II, he was deputy chief of the domestic radio bureau in the Office of War Information and a consultant for the Treasury Department from 1945 to 1946. From 1946, Rosenberg served as a program consultant for the Ad Council until 1973. Following several lectureships and visiting appointments at the New School for Social Research (1953-1959), Princeton University (1963) and Southern Illinois University Carbondale (1965), he became professor of social thought in the art department of the University of Chicago from 1966 until his death. Harold Rosenberg died age 72 on July 11, 1978 at his summer home in Springs, New York, from complications of a stroke and pneumonia. Rosenberg wrote several books on art theory, and monographs on Willem de Kooning, Saul Steinberg, and Arshile Gorky. A Marxian cultural critic, Rosenberg's books and essays probed the ways in which evolving trends in painting, literature, politics, and popular culture disguised hidden agendas or mere hollowness. The more exactly he grasps, whether by instinct or through study, the existing element of sameness in people, the more successful is the mass-culture maker. Indeed, so deeply is he committed to the concept that men are alike that he may even fancy that there exists a kind of human dead center in which everyone is identical with everyone else, and that if he can hit that psychic bull's eye he can make all mankind twitch at once. Rosenberg modeled the term "action painting" on his intimate knowledge of Willem de Kooning's working process. His essay, "The American Action Painters," brought into focus the paramount concern of de Kooning, Pollock, and Kline in particular, with the act of painting. Lee Krasner, Elaine de Kooning, and Joan Mitchell might also have been included, though their work was not then discussed in this connection. For the action painter the canvas was not a representation but an extension of the mind itself, in which the artist thought by changing the surface with his or her brush. Rosenberg saw the artist's task as a heroic exploration of the most profound issues of personal identity and experience in relation to the large questions of the human condition. 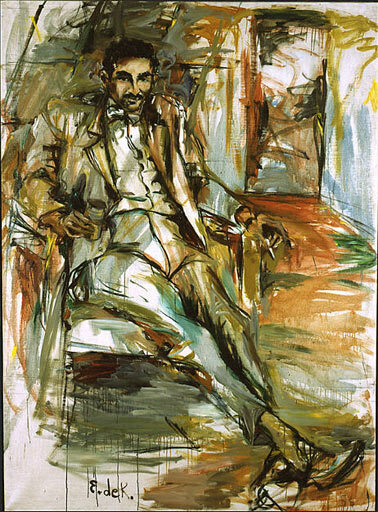 Rosenberg is also the subject of a painting by Elaine de Kooning. Along with Clement Greenberg and Leo Steinberg, he was identified in Tom Wolfe's 1975 book The Painted Word as one of the three "kings of Cultureburg", so named for the enormous degree of influence their criticism exerted over the world of modern art. Saul Bellow wrote a fictional portrait of Rosenberg in his short story "What Kind of Day Did You Have?". In 1987, Alan M. Wald quotes Rosenberg's 1965 "Death in the Wilderness" at the opening of his introductory chapter entitled "Political Amnesia" in his book The New York Intellectuals. ^ Harold Rosenberg. National Portrait Gallery, Smithsonian Institution. Retrieved February 22, 2008. ^ a b c d e f Russell, John (13 July 1978). "Harold Rosenberg Is Dead at 72: New Yorker Art Critic". New York Times. p. D16. Retrieved 20 January 2019. ^ "Harold Rosenberg Life and Legacy". The Art Story. Retrieved 2019-03-16. ^ "The Fall of Paris - Harold Rosenberg". ART THEORY. Retrieved 2019-03-16. ^ Rosenberg, Harold (Dec 1952). "The American Action Painters". ArtNews. 51. ^ "Harold Rosenberg #3". npg.si.edu. Retrieved 2019-03-16. ^ Wald, Alan M. (1987). The New York Intellectuals: The Rise and Decline of the Anti-Stalinist Left from the 1930s to the 1980s. UNC Press Books. p. 3. Retrieved 20 January 2019. Balken, Debra Bricker (May 2014). "Harold Rosenberg Versus the Aesthetes". Art in America. New York: Brant Publications: 49–52.